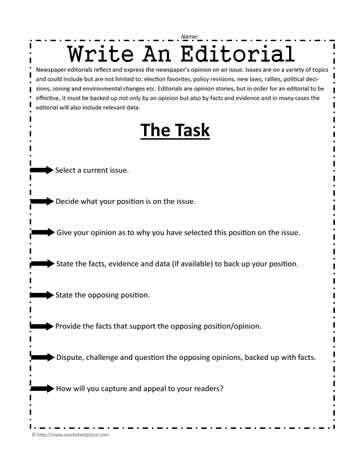 Do you know how to write an editorial? A News editorial express the newspaper?s viewpoint on something. The viewpoint could be on a variety of topics and could include: election candidates, policy changes, laws, new legislation, rallies and demonstration opinions, political decisions, environmental issues and changes etc. An editorial is an opinion story,to be effective, editorials are backed up not only by opinions but also by facts and evidence and in many cases the editorial will also include relevant data. Decide what your position is on the issue. Give your opinion as to why you have selected this position on the issue. State the facts, evidence and data (if available) to back up your position. Provide the facts that support the opposing position/opinion. Dispute, challenge and question the opposing opinions, backed up with facts. How will you capture and appeal to your readers?